This week, between hectic days at work, I wrote a short little flash-fiction. I had thoughts of sending it off into the wide world someplace and seeing if it would catch thirty dollars in some magazine, and then I realized ain't nobody got time fo' that before Thanksgiving, so instead I'm letting you read it. This was a fun exercise in an unusual (for me) POV. And if you're wondering, though the events are fictionalized, the tone and certain facts are definitely autobiographical. This is, in short, how it feels to walk downtown as Rachel Heffington. Ciao, ciao. So this is why you find yourself (having locked your keys in your car by accident in a downtown parking garage) instead of cursing, thinking, “Hey, an inconvenience is just an adventure wrongly considered, right?” This is why you smile expectantly at the next car that passes, hoping they will notice your predicament. You’ve got your purse, though, and your outfit is a power-house itself and there is a Place to Be, so let’s not allow imprisoned keys to set the afternoon counter-clockwise. You shove off the side of your car and swing your purse higher up your shoulder, headed toward the North stairs. The strap catches and dumps the contents of your purse’s outer pocket into the center lane of the parking garage. A BMW purrs up the ramp. It’s either dive for your Yves St. Laurent lipstick or let him run it into a woebegone, cinnamon-colored smear on the second-level ramp. Or some curried variation of the phrase. The horn-blast pierces back on itself as you check: all limbs accounted for. You go, girl. High-heels intact and everything. You smile and wave at the car’s taillights and reach the North stairs unaccosted. Take the two flights down. Exit on the quiet side of the street. There’s a light mist in town. It isn’t exactly coming down thick enough to warrant the umbrella you left in the (locked) car, but it’s going to settle in a fine mesh on your hair, pulling it into damp, clinging tendrils. You had wanted to look especially polished. Well, you lost that one. Two businessmen round the corner as you approach. You notice the vintage make of the taller one’s briefcase, the slim cut of his suit, the way his pocket-square matches his eyes. The broad set of his shoulders hunched against the vaguely-chill damp; his good hair and supremely wonderful beard. But it’s the compact, razor-burnt member of the pair who gives you a preoccupied smile. You return the expression, knowing full well his heart wasn’t in it. Still, a smile from a stranger is valuable, even though you might have been a mildly pleasant stocks-report for all the meaning in it. Hurry now. Skitter around the corner, past your favorite restaurant, scents of anise, cumin, coriander, Chinese five-spice, and teriyaki wrapping exotic hands around your stomach. You flip the collar of your trench against the mist and hunger, wishing again for a real, live Burberry and a festive meal with friends. You slowly pass your soul-mate store, tempting you with blank cards and paper for perfectly wrapping a yet-to-be-purchased gift for a yet-to-be-discovered Someone…dinner party invitations; placemats; card-cases; ink; cranberry-colored tassels. What you would do with a tassel doesn’t matter. You want one. You’ll find a use for it. You wait for a string of fancy sports cars to finish their intricate four-way stop-sign dance and then hazard your chances getting across the intersection. After all, you don’t want to end up a woebegone, cinnamon-colored smear in the pavement. Plenty of people are gathered around the fountains in the Town Square as you flit by. You know you shouldn’t really stare at the couple having their date in the table at that picture- window, but you can’t help a quick peek. Bad news: they look up at you. The man laughs. His date narrows her eyes. Oh well. You cross again at the haberdashery store with its emblem of the Golden Fleece. Yeah, you’d need the corner market on the entire Golden Fleece trade to afford anything in there, but someday. Someday. Despite that Place to Be, you pause to view the model in the show-window and your hand automatically slides up this side of the glass to touch his cashmere sweater, to fix his tie, to rest your palm on his chest and inhale the scent of his cologne. Some shop-girl with civil eyes and devastating cheekbones steps into the case and fixes the tie for you. So he, also, belongs to someone else. You duck against the mist that has somehow become a rain and press on through more businessmen in tailored suits, more women thinner, chicer, more successful in their careers than you, skirt a few hopefuls dancing hip-hop to a beat straining from a rattled boom-box. A smile for them all. They don’t notice. Not most of them. But that’s okay. Smiles are cheap currency. At last you’ve arrived. The sign ahead shines bleary-eyed against the rain and you hush into the simple, glass-fronted shop. Here, it is warm and dry. The others inside blink up against the dampness you brought. Laughter swells inside as you wring out your ruined hair and feel your heart pushing eagerly against your breast-bone. Adventure. Adventure. Adventure, it beats. “You’re late,” the others say in their several, silent ways. “Meet any dashing strangers this week?” a girl asks from the far side of her earl grey latte. In the foam is drawn a plumy feather. You order a chai tea latte made with whole milk instead of water and wait as the new barista draws the foam. 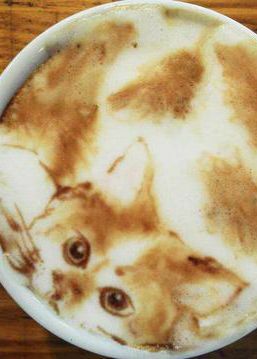 Will he make a string of hearts or a leaf or the latte-cat you’ve waited for your entire coffee-drinking life? He sloshes the cup across the bar and you catch it, scalding-hot against your palms. “Thanks.” Then you see he didn’t know how to make the art, or didn’t bother to. Your foam is looking spectacularly like, well, foam…with a careless brown blob in the center. No leaf, no feather, no hearts. Definitely no cat. Your heart settles into its everyday promise:. Maybe next time. Carefully, so as not the spoil the art-that-wasn’t, you carry your latte to the corner booth. The booth that’s always empty every Thursday afternoon around four; the time you come. In you slide, down you slip, and even though it’ll come off on the cup’s rim, you swipe on some of the rescued lipstick. You never can tell when you’ll meet with an adventure. Suddenly, the door jangles open and a swath of damp air matches itself against the back of your neck. Confident steps stride to the counter. The little hairs on your arms stand up tall. Something big just came through that door. You lift your coffee and sip, rotating just enough to watch the newcomer without it appearing to be your sole mission. Italian-looking shoes. Slim-fit, navy slacks. A trench-coat, belt knotted behind. A trilby, for lawd’s sake. He orders black coffee, extra hot, takes one hand out of his pocket and pays for it. As he waits for the coffee, he surveys the crowd in the shop, like he’s a regular and they’re the newcomers, drumming the fingers of his right hand on the polished cherry bar. Polished till it gleams almost as dark as his hair. Bluffing, you think. You’ve never seen him here on a Thursday at four. As if he heard that thought, his gaze roves to you. The eyes crinkle and a grin –the best kind of grin—quirks at the corners of his mouth and finally cracks wide open, for you. He gives a two-fingered salute and you contemplate the consequence of trying to vanish into your latte. “Black coffee, extra hot, for Grady?” bawls the barista. You peer around the shop. Gosh, it’s true. You’re thankful for the decision to add lipstick and deftly rub off the evidence from the edge of your for-here mug. But before you have a chance to say anything even mildly intelligent, he takes his other hand from his pocket and clasps both around the mug. “Chilly out there, isn’t it?” he remarks. Tiny drops of silver cling to his lapels, his shoulders, even his finely-etched face. You nod, your heart a tiny, startled lump of chilliness itself. “Didn’t expect it to start pouring like that.” He taps the fingers of his left hand against the mug, wedding ring clinking fatefully, as he stares out at the rain. So he, also, belongs to someone else. And just like that, your heart begins to chug again, pulling itself back on the tracks, steaming along through life to the rail-song, Adventure, adventure, adventure. Somehow you make small-talk and he finishes his coffee and you finish your latte and he leaves and nothing is different than any other time in your young, long life except that maybe you’ll put him in a book someplace. For a second, you thought it had happened. You’re a little ashamed of having thought it was happening. Wryly, you notice how you’ve been knotting your hands in your lap, biting your bottom lip. You stop all that. There’s always someday. Probably someday an adventure will come your way and the dashing stranger won’t be married and maybe you’ll buy a coat and you’ll find a twenty in the outside pocket and perhaps Diane von Furstenburg will start making dresses in a size fourteen and maybe, you know, someone will give you an inheritance or you’ll go on a road-trip and end up by mistake in a town called Accident. It happens, you know. You grab your purse, slide out of the booth, and return the lipstick-stained mug to the dish-rack. You wave goodbye to the girl with the foamy feather and step back into the rain, smiling again at the people who don’t notice. And at any rate, there’s still the matter of what to do about your keys. This is beautiful! I love the message it portrays! This was beautiful. Your writing always seems to sweep me away, and I love every minute of it. I think this is the most beautiful piece of fiction I've ever read.